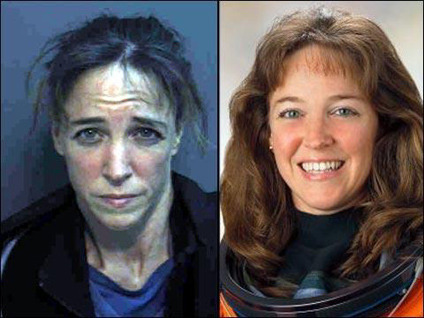 ORLANDO, Florida - A former astronaut banished from NASA after she attacked a romantic rival is being kicked out of the Navy, officials said Thursday. Nowak was accused of confronting Colleen Shipman in the parking lot of the Orlando International Airport in February 2007 after driving from Houston. She had diapers in the car, but Nowak disputes she wore the diapers. Shipman, an Air Force captain, had begun dating Nowak's love interest, former space shuttle pilot Bill Oefelein. Nowak was sentenced in 2009 to a year of probation in the attack after pleading guilty to burglary charges. Since her dismissal from the astronaut corps, Nowak has been working at the Chief of Naval Air Training station in Corpus Christi, Texas. Her retirement takes effect Sept. 1. "Our rule is to make the right decision," said Lt. Alana Garas, a Navy spokeswoman. "There was a lot of material associated with this case."